2 Batteries (1 Spare) Included! Wrist Strap and Metal Case Included! Click on this link if you need more information about a Infrared Thermometer. The OS-FS is a compact, lightweight, easy-to-use pocket infrared thermometer. Features include adjustable emissivity, °C/°F switchability and built-in lock mode. 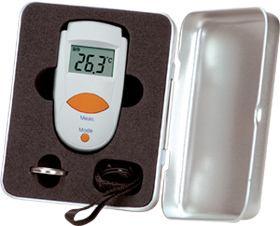 It is ideal for quick temperature measurement between -33°C (-27°F) and 220°C (428°F). The OS-FS is designed for operation close to the target. For best results, keep within 1 to 2 cm (˜0.75") of the target. Distance to spot ratio is approximately 1:1.3. Spot size is approximately 4 mm @ 5 mm and 9 mm @ 11 mm. Nota: Comes complete with 2 (two) batteries (1 spare), wrist strap, metal carrying case, and manual.